Grossly, in areas of endometriosis the blood is darker and gives the small foci of endometriosis the gross appearance of "powder burns". 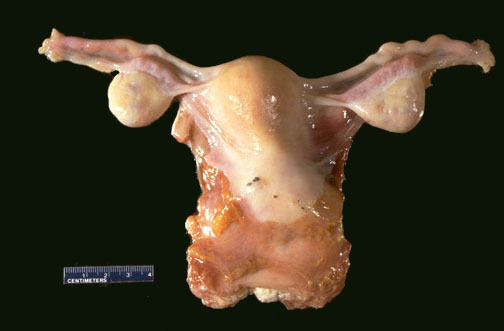 Small foci are seen here just under the serosa of the posterior uterus in the pouch of Douglas. Such areas of endometriosis can be seen and obliterated by cauterization via laparoscopy.